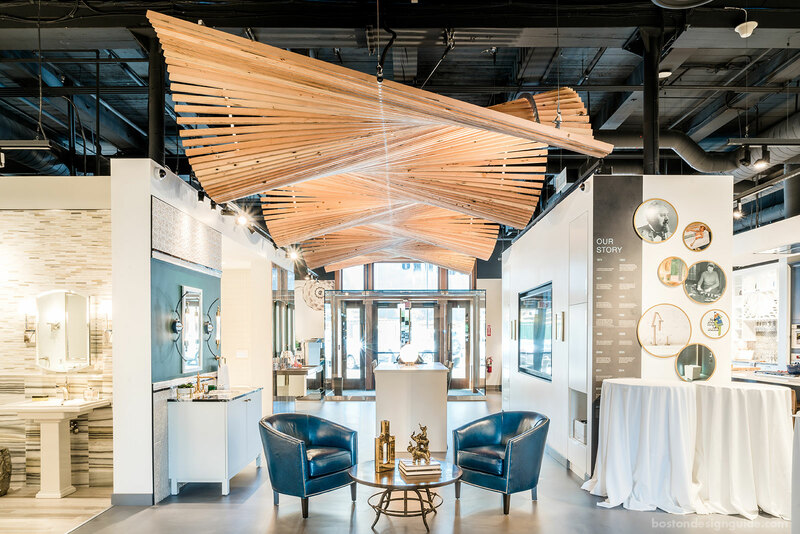 When sustainable artist Jeff Soderbergh, of Jeff Soderbergh Custom Sustainable Furnishings, was approached by Jamie Reardon, owner of Supply New England, to provide a dramatic ceiling element for their flagship showroom project with Kohler on the waterfront, he urged them to consider “what they wanted in their hearts.” Once he saw the space and discussed initial concepts, he set to sketching, dreaming up the Kohler Wave, a hanging sculpture that uses reclaimed wood salvaged from a nearby pier from the early 1800s invoking the movement of water. Director of Showrooms Sabrina DaLomba and the team at Supply New England were sold in one sketch. DaLomba first learned of Soderbergh, who has a Newport studio and a warehouse full of historical, reclaimed materials that he crafts into art, furniture and flooring, from a friend. The referral came at the exact time she needed an artist who does expressly what he does. “It’s like it fell out of the sky,” she says, with wonder in her voice. Once she learned that they could “drill down regionally, not only to Boston, but to the harbor” for the materials, it was a lock. "We kept the gray side down," says Soderbergh. "As you walk underneath it, the gray part faces you, while the rest of the wood is all milled and beautiful and bright," juxtaposing shadow and shine. Building the Kohler Wave was a challenge, but Soderbergh learned years ago to say yes to things he hasn’t done. With 405 pieces in total, and at 32x12 feet, the work would have to be modular in order to get it in the door. A cradle was designed to allow the work to be assembled within it and lifted from the cradle rather than the sculpture. 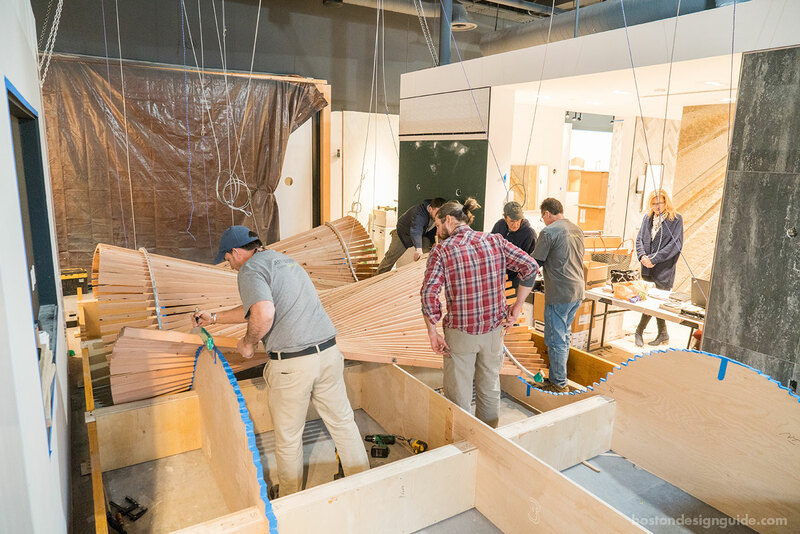 Artisan Building Group installed Soderbergh’s vision, with the full team hoisting the Kohler Wave high, “like Olympic rowers,” says Soderbergh. Supply New England was so enamored with Soderbergh’s work that they commissioned Array, a second sculpture for the showroom. 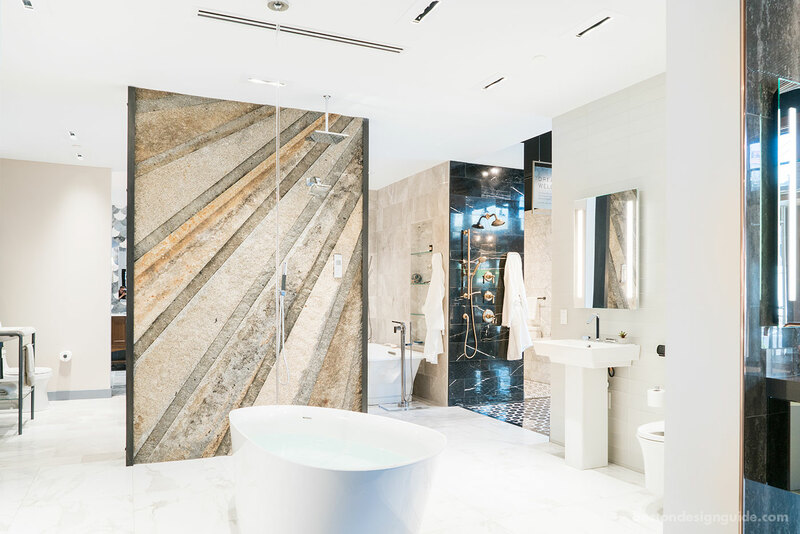 The radiant work is comprised of ballast stone dredged from Boston Harbor, and serves as a rugged, organic backdrop to a chic, freestanding Kohler tub with a ceiling filler that sends a steady stream of water from above.